The Australian DIY market continues to grow every year. People are taking on bigger and bigger projects, no doubt getting ideas and motivation from the number of makeover shows on TV. Shows like The Fixer Upper, House Rules, The Block and Love it or List it are just a few of many renovation and restoration shows you can watch. All these shows get millions of viewers every week. It’s a sort of home renovation epidemic. The renovations search gets as many hits on the internet as does buying a home. People trawl Instagram to get DIY ideas and some inspiration and compare notes with friends. And in their free time? They watch shows on home renovation. The market growth in DIY is a cultural change in our society. Houses are seen as an investment and a DIY project increases the value of that investment. Young couples are not looking to start a family straight away. They prefer to use their disposable income on their homes. The DIY market is showing growth in much larger projects, not just room makeovers, but complex home extensions such as an extra room, a gazebo out back or a patio for that Australian way of life – outdoors. Housing lots are getting smaller. Gone are the quarter acre and half acre lots, they are simply too expensive and reserved for those that can afford the price. At All American Roofing, we are in the business of supplying and installing asphalt roofing shingles. We would like to make it clear that we do not consider re-roofing your whole house as a DIY project. To be honest, that is really a job for professionals. If you took a tour of this website you would see the complexities involved within the process. For experienced roofing contractors, it’s a bit of a ‘walk in the park’, but that might not be the case for even an experienced home handyman. If we took one of these smaller projects, and helped you build it and then roof it with our product, you will get the benefits of completing a job in a professional manner, as well as seeing the difference an asphalt shingle roof makes when sitting on top of a structure. Kids sometimes get bored with traditional outdoor activities, even if you, as a parent, promote outdoor play. By building a cubby house, a ‘secret kingdom’ for your kids, it may help cut down on the boredom. 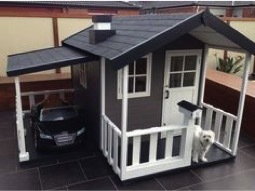 If the project is going to be a cubby house, and you have decided you are not going to buy a pre-made unit, then you will need to plan the job with regards to equipment and materials. There’s nothing better than searching online. You might not see exactly what you want, but you will get a pretty good idea with pictures and possibly even cubby house plans. Another good idea is when you are planning the construction, think about the future additions you can add as the kids grow – sandbox, slide and a swing perhaps. Keep in mind the age of the children for whom you will be building the cubby house. We mentioned additions or attachments earlier, so allow for bigger swings and monkey bars as the children grow. Is the cubby house going to be for girls or boys or a mixture, a sort of unisex structure? How big is your backyard? A small backyard will limit add-ons at a later date as well as restrict the size of the cubby house. It’s possible that a well-built cubby house may even add value to your home resale. 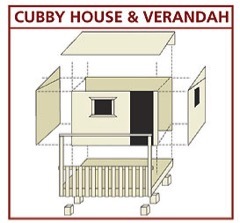 There are a number of different styles of cubby houses you can build, restricted only by your imagination. 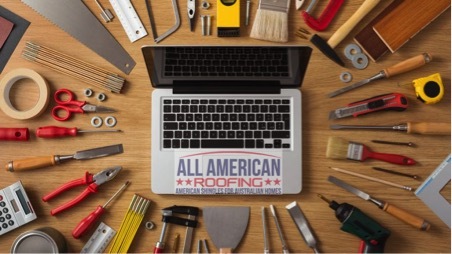 It’s when you get to the roof that All American Roofing can be of great assistance. We can provide you with a list of materials and tools you will need, as well as a catalogue of the different colours and styles of shingles. The installation of the shingle roof is basically a miniature version of how we would install a roof on a normal sized house. The idea is to keep the occupants (the kids) dry if it rains, and keep the sun off and the heat out during the summer. The basic tools will be required – hammer, saw, drill and bits, tape measure, sander, shifting spanner, nail punch, pencil, spirit level and a wood chisel. Shingle Roof – material will be supplied by All American Roofing. Show them the plan and they will supply the correct amount and types of Timberline shingles (your choice), plus all the other requirements, such as a weatherproof membrane, clouts to nail down the roof, etc. All American Roofing is available to answer any questions you have about the construction. Feel free to call us about what you are doing, and we will be only too happy to provide all the info you will need to make this project a successful one.